The medium-duty and heavy-duty truck segments offer unique challenges to VIN decode properly. Almost all commercial trucks offer many options to significantly customize and up-fit the vehicle. These options and up-fits include everything from engines and transmissions to axles, cab types and body types, all of which can substantially change the details and specifications of the vehicle. (For more information on the challenges of decoding large trucks see our article “VIN Decoding Outside the Light-Duty Segment”.) The customized nature and complexity of these vehicle segments has contributed to their being few commercial VIN Decoding solutions available for large trucks. Although the medium-duty and heavy-duty truck market is not as large of a market in comparison to passenger vehicles, commercial trucks are a backbone of the nation’s economy. As a result, there is a significant need for accurate and reliable data to identify these vehicles. This is a need that many of our customers had approached us about over the years. The challenge for DataOne was twofold. We did not have an in-house solution to offer existing or potential customers. We had a hard time identifying a reliable commercially available solution that we could even recommend to our customers, which was equally frustrating. We are excited to say that is no longer the case. In February 2013, DataOne Software released VINBasicTM HD, adding it to our VINBasicTM suite of VIN decoding products (view press release here). VINBasic HD is a VIN Decoding solution for the Medium and Heavy-Duty Truck segments that offers industry leading accuracy and coverage of the segments. These vehicle segments include the vast majority of commercial trucks on the road today, and represent a valuable dataset to the numerous companies that manage, insure, finance and service these fleets of vehicles. 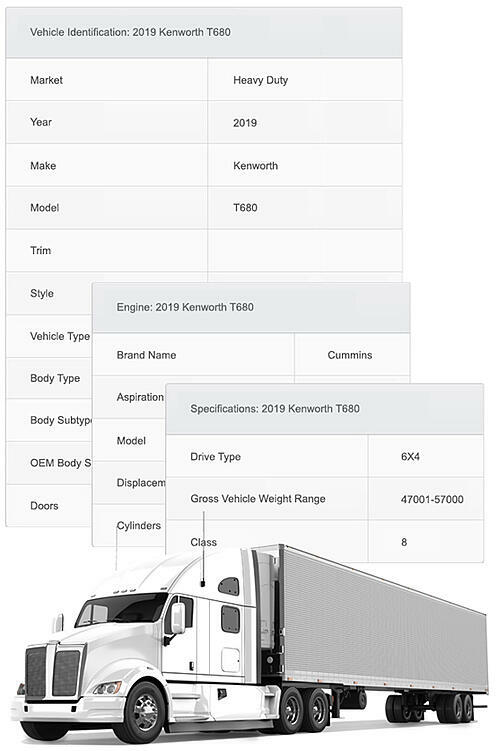 Consistent and normalized data - includes critical details of vehicle identification, engine information, axle configuration, gross vehicle weight, etc. VINBasic HD is available through DataOne's VIN Decoder API Web Service (XML/JSON) and Flat File (FTP). This is the same service that our customers have used for years to VIN decode passenger, light-duty and powersports vehicles. With the addition of VINBasic HD to the web service and flat file, DataOne now offers a single business solution capable of VIN decoding everything from a Vespa scooter to a Mack truck.